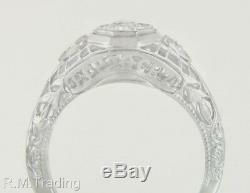 27ct Genuine Diamond 18K White Gold Victorian Era Ring. 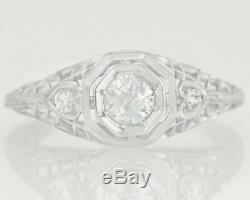 Featured for sale here is an antique Victorian solid 18K white gold genuine diamond engagement ring!! This lovely antique band holds one. 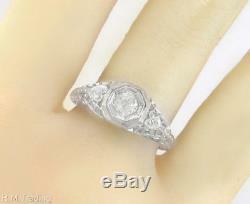 23ct G SI2 genuine diamond in the center with two. 02ct diamonds on the shoulders inside heart detail! Charming foliage design throughout for that special added touch! This is a classic and timeless Victorian design that holds its beauty and will never go out of style! This piece is sure to stun with its fine detail! 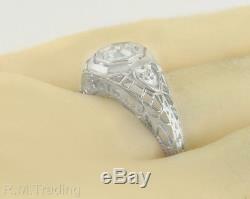 Ring is personalized with initials "RFP to CRZ" and "MAR 30 1904" in exquisite cutout filigree work! 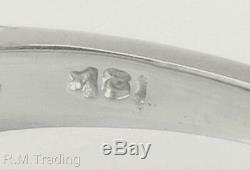 Unique custom detailing shows the quality of the craftsmanship that went into this ring; custom initials and date are set in with prongs and can be removed if desired! Made from solid hallmarked 18K white gold! 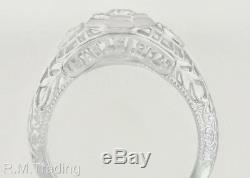 Ring measures 8 mm wide at the front and rises 6 mm above the finger. Great design with stunning craftsmanship makes this a must have! Add this ring to your collection today! Thank you for shopping with us! We work hard to describe our items as accurately as we can. We attach large up close photos so you can make your own assessments. Condition, quality and grading of items varies by individual and these are our opinions. The gemstones and diamond in our pieces are all 100% natural unless we have stated they are not and label them lab created or simulated. The item in the photos are the actual item you will receive! The approximate retail price we state is not an appraisal; we do not provide appraisal prices on the items we sell. You are the only person who can determine the worth of the piece. 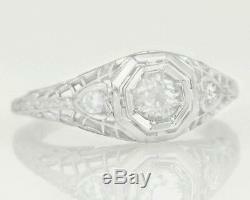 27ct Genuine Diamond 18K White Gold Victorian Era Ring 1904" is in sale since Sunday, April 2, 2017. This item is in the category "Jewelry & Watches\Vintage & Antique Jewelry\Fine\Victorian, Edwardian 1837-1910\Rings".trading" and is located in Dearborn, Michigan. This item can be shipped worldwide.